"Thank you to everyone who prayed for me," Salud Hernandez-Mora, a longtime correspondent for Spain's El Mundo newspaper, said Friday in her first comment upon being freed. "I've always been imprudent, because a reporter needs to be imprudent or they'll miss half the things," Hernandez-Mora said during an improvised press conference in the city of Ocana. The incident shook Colombia because the ELN in March had agreed to join the much-larger Revolutionary Armed Forces of Colombia and pursue a peace deal with President Juan Manuel Santos' government to end a half century of fighting. Santos, who has demanded the ELN renounce kidnapping and free its captives in order for those talks to begin, celebrated Hernandez-Mora's release from Catatumbo, where he had traveled earlier Friday to personally oversee the search efforts for the journalists. 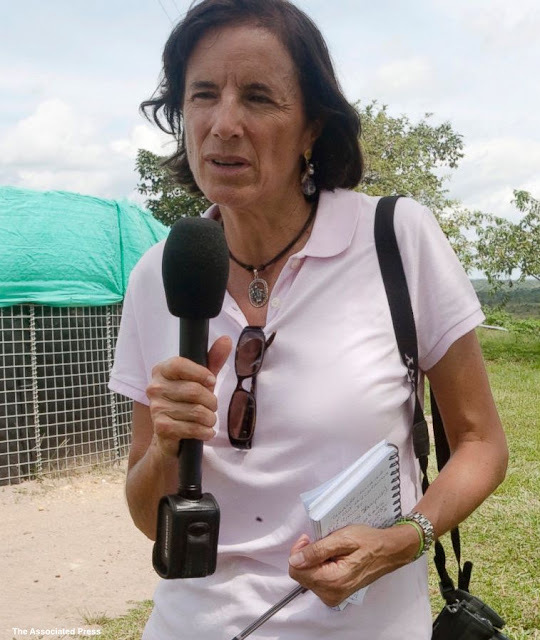 In addition to her work for El Mundo, Hernandez-Mora is one of Colombia's most-prominent columnists, admired and reviled in equal measure for her outspoken conservative views against Santos' peace efforts. Her disappearance last weekend while on assignment shocked Colombians who have experienced dramatic security gains in recent years as Colombia's half-century conflict winds down. The release Friday night of Diego D'Pablo and Carlos Melo came as loved ones were holding a religious vigil in their hometown of Cucuta. D'Pablo's adolescent daughter broke down in tears when she spoke live on TV for the first time with her father. The Jamaica-sized Catatumbo region of northeastern Colombia is among the country's poorest, most marginalized backwaters. It is a major coca-growing area and a corridor for cocaine smuggling to Venezuela, with the state able to maintain only a few militarized strongholds. "Catatumbo is an area abandoned by the Colombian state, with tremendous social problems and I'm not sure how they're going to be resolved," Herandez-Mora said.